Games Toaster is a computer and video games news, analyses, information, and opinion service with a focus on the Republic of Ireland, and Northern Ireland. This is a privately owned independent publication. With a remit to cover all computer games from PC to consoles to handhelds and beyond, the site manly contains local news relevant to Ireland. This site is featured on Google News, News Now, and Topix.net. Editor/news writer: Cian Ginty. Contributor: Craig Gallagher. Past contributors: Andrew Mac Cann, Damien Fagan, Dean Monnox, Peadar McMahon, Ben Preston, Colum Whelan, and Brian Lloyd. Games Toaster has had an online presence under different names since as far back as 97/98, it was originally set up as a ‘hints and cheats’ website, then it expanded into news and reviews, in 2000. 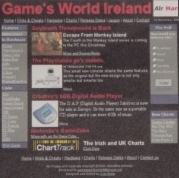 Originally named Games World Ireland (pictured, right), at the time not knowning the Irish retailer of a similar name, then changing in early 2000, while going into news and reviews the site adopted the name the Irish Gamer. After some time offline in 2001 and 2002 for the development of a new site, fresh content started again, published on Gamire.com, a site developed with the once infamous, now defunct games/internet café Does Not Compute, who previously had premises in Dublin in Temple Bar, and above the ‘Bleeding Horse’ public house on Camden Street. By 2005, our editorial staff were working under the name ‘Games Toaster’ for some time while still providing content for the old site. In the first weeks of January, the switch had commenced, with content being publish on both sites Gamire.com and GamesToaster.com. On January 30, a roundup of news from GameToaster.com was published on Gamire.com; it stands as our last contribution to that site. Please note: our current online archive is currently incomplete, in due time we plan to upload the reminder of our news and reviews archive to this site.